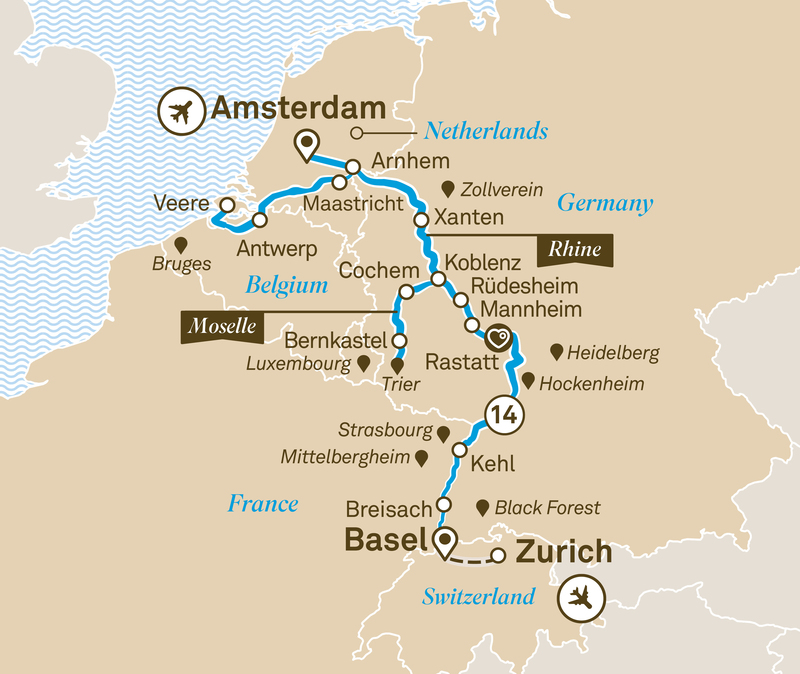 Our 15 day Romantic Rhine & Moselle river cruise will see you travel from Basel to Amsterdam. Visit Strasbourg, Mannheim, Cochem, Bernkastel and Antwerp. Anyone who doesn’t believe in the power of romance has never travelled along the Rhine or its idyllic tributary, the Moselle. In fact, on this itinerary, there’s probably a fairytale moment waiting just beyond the next river bend. The castles that grace this region sometimes seem as if they were lifted straight from the silver screen – hardly surprising as it’s a region that’s long been favoured by Hollywood directors. From Lorelei, the Rhine river siren said to lure sailors to their demise, to the legendary Black Forest, which still resonates with imaginative children’s tales, there are stories and romances galore to discover and delight in. You may even compose a few new ones of your own.